We use this site to manage player numbers and to ensure that there are neither too many nor too few players at each game. To join games, players must join the Durham Pickup Soccer Group and register online for individual games. For detailed instructions on how to join the group click here. Our group now has over 2,000 adult players and is growing rapidly. 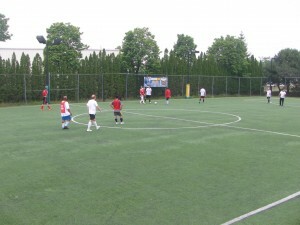 7-a-side Men’s Ladies’ Coed and Mens Over-40s games are played year round on DISC’s indoor and outdoor fields. Other ad hoc games are scheduled as field availability permits.